Are you excited at Halloween? I made some rice balls !! 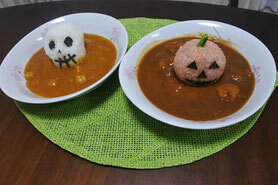 These are recipe of skull and Jack O'Lantern rice balls. (1) Form the rice ball into a skull. eyes ,a nose and a mouth. (3) Attach them to the rice balls. (1) Mix ketchup with cooked rice. 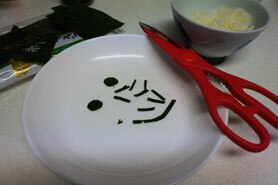 (2) Cut a sheet of seaweed into eyes, a nose and a mouth. 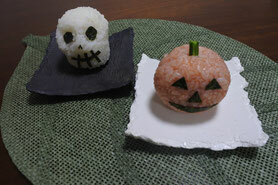 (3) Form the rice ball into a Jack O' Lantern. (4)Attach the cut sheet to the rice ball. We had the rice balls as curry rice !! Have a nice Halloween ! !